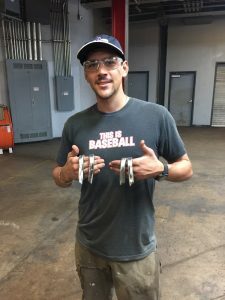 Mason, 21, from Lafayette, Louisiana, graduated from the Welding Specialist with Pipefitting program at Tulsa Welding School & Technology Center in Houston in September 2018. Thanks for sharing your story, Mason. What did you do before welding school? I went to college in Arkansas for two years doing Engineering. I was making decent grades, but I wasn’t sure that I wanted to sit at a computer doing blueprints. I knew I was good with hands-on work and I knew welders made good money, so I started to research welding schools in Arkansas. A friend who went to the Tulsa campus referred me to TWS. I looked the school up and saw it’s the number one welding school in the U.S. I decided if I were going to go to welding school, that’s where I would go. When did you get the idea of becoming a welder? During my summer break from college, I worked in the oil fields in Ruston, Louisiana, with my friend who went to Tulsa. He said they needed some hands out in the field. That’s how I got introduced to welding: out there on the job, seeing how it’s done, watching the procedures. I saw the money these guys made, and that’s when I got the idea. What interested you about welding? I knew I would be interested in it because I’m good with my hands. I like to build things. There were welders out there making big money, at least $60 an hour with their own rigs. I thought that was pretty slick. They’re out there welding 24” pipes and bigger, making money. Had you done any welding? Just small projects at the house for friends and family, but really I had no experience. When I got to Tulsa, I knew how to strike it up, but that was about it. I couldn’t run a bead. Why did you choose the Welding Specialist with Pipefitting program? At orientation, they showed us average annual salaries for welders and average salaries for pipefitters. During orientation, a few instructors said that if you can do both welding and pipefitting, then you are a better tool and you can be used more. Companies don’t have to pay double for two people. If you can do both jobs, you get a pay bonus and the company saves some money. Pretty much all of it. The instructors are really good. They tell you their stories and techniques. They gave us all the advice they could throw at us. They also try to help you get a job, using their connections or just being a reference. You also create a bond with the guys you’re with. 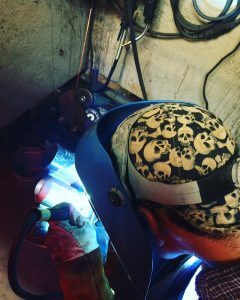 Most of us started out not knowing how to weld, so that brought us together. If one of us was having trouble, we would help each other out with pointers and tips. Working in the shop, the hands-on part, was my favorite because I don’t like sitting around in a classroom all day. You graduated just last week. How is the job hunt? I’ve gained two jobs through school. The first is a contracting job with National Boiler Service. It’s one of the hardest welding tests out there, so the school gave us a two-week training course. Then NBS came to the school so we could take the weld tests in an environment we were comfortable in. It’s a good job, but it’s contracting. I wanted something steady to start, with a guarantee of at least 40 hours a week. I didn’t want to worry about being on a job for two months, then finish and maybe not work for a month. So what is the second job? I started with Milestone Metals doing structural welding this week. I got the job through Career Services. They are based in Houston, but they also have traveling jobs. They are talking about sending me up to Dallas. It’s very good pay and a good per diem, the whole nine yards. It’s great to come out of school with choices. That’s the great thing about the welding field. You can stay close to home with a steady job in a shop or a company with set hours, or you can work contracts and do a lot of traveling. See the world, see the country. Maybe work for three months and then take a month off. I can still work for National Boiler Service because it’s contracting. They actually called me with a job while I was still in school. It was too early, so I couldn’t take it. But if they were to call me while I’m at Milestone and tell me they have a four-month shutdown project, there’s nothing to stop me packing up to go for the bigger money. I’ve told Career Services that anything to let me know if they see that involves traveling with decent pay, and they definitely do. I was tight with Career Services. I’d talk to them almost weekly to see about new jobs. They’ll continue to help you long after you graduate. If you’ve been out of school for two or three years, if you stay true to your word and don’t disrespect what they do for you—don’t fail a drug test or have a bad work ethic—then they’ll help you for as long as you need. They can even hook you up with part-time jobs—nothing to do with welding—if you need money to live during school. Are you excited about your first welding paycheck? I’m really looking forward to it! This is what I’ve been working toward for the past nine and a half months. It’s the result of all that hard work and dedication. I’m going to try and save a little, but I’ll take my family out to a nice dinner. I’ve stayed pretty true to my plan with a few tweaks. I wanted to start out with a more stable job like Milestone so I can save up some money. I’m planning on building a welding truck and then going out to the pipeline. Then hopefully one day I’ll start my own company. What kind of work will your company do? When I was at school, I did exceptionally well. I was one of the top welders in my class, so I can do pipeline, structural, anything. I’d probably like to do structural because I did some remodeling, construction and landscaping in the past. Maybe I can throw all that together with woodworking and welding and have a one-stop shop. The way to be 100% successful at this school is to stay in the booth and weld as much as you can. Treat it just like a job. That’s how I did it. Stay after hours and dedicate your own time to it. You can’t afford to slack or goof off. The school is open 16 hours a day, so take advantage of that. It’s all about asking questions and figuring out new techniques. You can ask any instructor how to do something; it doesn’t matter which class you’re in. Everybody has different techniques, and certain things work for certain people.